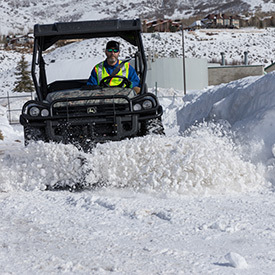 The John Deere line of Gator™ utility vehicles offer professionals a versatile tool ideal for snow removal. With three lines, including the Work Series, Crossover Utility Vehicles and High-Performance Utility Vehicles, there is a model with the cargo room, speed and passenger space needed for any task. The Gator models can be further transformed for snow removal tasks with attachments. Blade attachments allow the operator to easily plow snow, while bed sprayers enable operators to efficiently spray de-icer throughout the largest of properties.